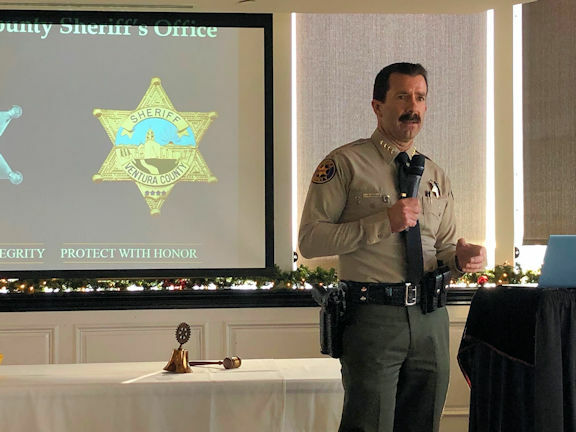 It was our Club's distinct privilege and honor to host Ventura County Sheriff Bill Ayub as our meeting speaker on Monday, December 3. Sheriff Ayub gave a fascinating overview of the department he now leads, having been elected to his post on June 5. As the largest law enforcement agency in the County, The Sheriff's Office utilizes 750 sworn deputies, 500 professional employees, and 1,000 volunteers to provide its wide range of law enforcement-related services in 1,872 square miles of Ventura County, including the Cities of Camarillo, Fillmore, Moorpark, Ojai, and Thousand Oaks, as well as unincorporated areas. Those services include patrol, arson/bomb squad, SWAT, crime analysis, a forensincs lab, narcotics enforcement, and detention services, to name a few. Detention services include management of the Todd Road Jail. Sheriff Ayub detailed the plans for the expansion of the facility (currently underway), which features a new health and programming unit for acute and psychiatric care of inmates. The 64-bed facility is scheduled to open in mid-2019. Sheriff Ayub also spoke about his Office's efforts to fight the growing opioid crisis, noting that annual opioid-related arrests have increased from fewer than 90 in 2009 to 165 in 2017. Medical malpractice, he noted, is a primary factor in the increase. Using video clips in his presentation, Sheriff Ayub explained the value of technology such as heat-seeking surveillance from the department's six helicopters and body-worn cameras for patrol deputies. Since their initiation, the 325 cameras have logged more than 45,500 hours of video. He also noted that the Office's Unmanned Aerial System (commonly referred to as drones) has played a big role in search and rescue, warrants, suspicious device investigation, and back country marijuana eradication. Thank you, Sheriff Ayub, for the service you and your deputies, employees, and volunteers provide, and thanks also for taking time from your busy schedule to visit Ventura Rotary South!